The Dagana Dzongkhag launched its first local and organic farm products on August 24 in Tsenda-Gang Gewog. The farm products are labelled as Dagana Products. The products include pulses, mustard oil, tengma or flattened maize, bamboo shoot pickle and honey. “It is to promote farm-based cottage and small industries in the dzongkhag. 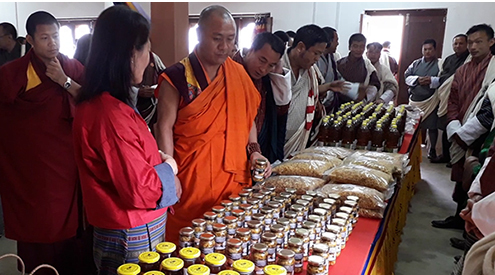 Also, it would offer farmers an opportunity to earn income, while consumers will have access to organic products,” Passang Tshewang, the Dzongkhag Agriculture Officer, said. As part of the launch, five farmers’ group from different gewogs displayed their local products. They said such an initiative will benefit them. “Farmers do not have a place to sell their products, so we buy from them giving them an opportunity to make some income. At the same time, we also make some profit,” Tshering Lham from Drukjeygang Amsu Detsen, said. “We established a beekeeping association in 2011 in Tashiding Gewog. We have no problem in selling the product as the government helps us in marketing it,” D.B Waiba, the Chairperson of the Beekeeping Association, said. “We buy mustard seeds from the farmers, produce oil and sell it. With support from the dzongkhag, we hope we will be able to do well,” Passang Dawa Sherpa, the Chairperson of Mustard Oil Production Tshogpa, said. The dzongkhag administration had spent more than Nu 2 M to buy equipment for the farmers’ group to produce local products.